Mullery auctioneers is currently offering for sale No 92 Clybaun Heights, a spacious detached residence boasting a superb location in this mature and highly desirable development, ideally positioned with a southerly aspect to the rear. The property has been exceptionally well maintained and upgraded by the current owners and is presented in excellent decorative order. The residence benefits from a host of attractive features including marble tiled floors to the porch and hall, a beautiful fitted kitchen with a range of integrated appliances, walnut wooden floors to the living room, an upgraded shower room, central vacuum system, two en suites, and PVC double glazed windows. The accommodation comprises porch, hall, living room, kitchen/dining room, utility room, family room, four bedrooms (two en suite ), and shower room. Outside to the front is a large paved driveway bordered to the sides by raised flowerbeds. Gates on either side of the house lead to the rear garden. The rear garden features a paved patio with direct access from the kitchen/ dining room. Steps lead down to a low maintenance garden. 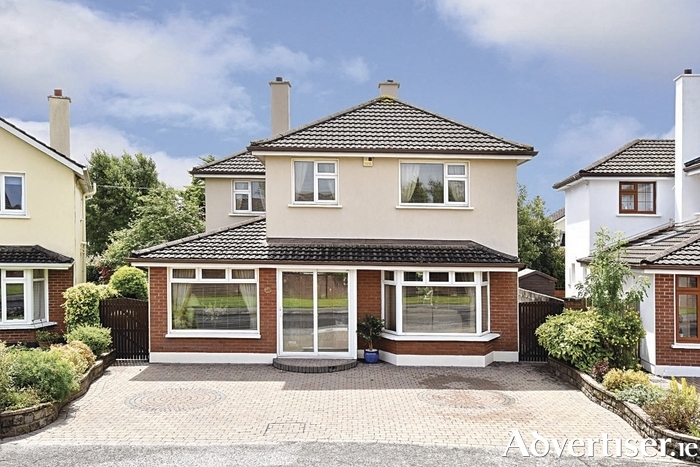 The location of the property is superb with all local amenities available within easy walking distance including primary and post primary schools, supermarkets, shops, coffee shops, Tom Sheridan’s Bar and Restaurant, The Clybaun Hotel and Leisure Centre, church, park, and public transport. Viewing is highly recommended for anyone seeking a quality family home close to all necessary services and amenities. Full details are available on www.mulleryauctioneers.ie or call Mike Mullery of Mullery auctioneers on 091 567275.